This show will air on Friday March 29, 2019 on PhillyCAM’s radio station WPPM 106.5 FM in Philadelphia. Hear the audio on PhillyCAM’s podcast site on Soundcloud. The script is below. Produced by Meenal Raval & Tanya Seaman, with technical assistance from Vanessa Maria Graber. We know the climate crisis is caused by each of us using fossil fuels to get around, to be comfortable inside our homes and office buildings, and for our appliances. We know that this results in greenhouse gas emissions. We also know that the solution lies in no longer burning fossil fuels, shifting to motor vehicles that run on electricity, using heating and cooling systems that do not use fossil fuels, and transitioning to 100% renewable energy to power all of this — to bring our emissions to “net zero”. What does “net zero” mean? It means that although we might produce some greenhouse gas emissions, we have other systems in place — like lots of trees — that absorb and use these emissions so the overall effect is that we have no emissions, or net zero emissions. So, how do we get to net zero emissions? Meenal: Today, we’ll talk about a few ways we can get to net zero emissions. A quick answer is: Electrify Everything, and Power it All with Clean Energy. To help with policy to guide this, we need to get our politicians on board. Most of us assume our elected leaders will do the right thing to get us out of the climate crisis. But will they? The Kenney administration has OK’d SEPTA’s Nicetown gas plant as well as PGW’s liquid natural gas (or LNG) project. Both projects increase our dependence on fracked gas (a known fossil fuel) for another 25 years. At a time when we should be investing the same millions of dollars into emissions-free renewable energy. And do we know what to ask a candidate running for Mayor or City Council? We’ve made a list, right Tanya? We ask that each candidate commit to taking no fossil fuel money. When decision-makers like politicians take money from anyone or any company, they are usually beholden to those people and organizations, and make short-sighted decisions that benefit them and their shareholders. They do not make rational decisions that are in the best interests of everyone, like us constituents. Since fossil fuels are destroying our planet and most directly, the environment in which we live, we don’t want our politicians to be biased toward building fossil-fuel projects. The decisions moving forward need to be about all of us; not about a few people making profits. The No Fossil Fuel Money campaign is being led by national groups you may have heard of: the Sunrise Movement, 350.org, Food & Water Watch, Friends of the Earth, and Greenpeace. Many politicians as well as candidates across the US have signed this pledge. With about 121 Pennsylvania incumbents and candidates signing this pledge, we only see 5 Philadelphia City Council candidates listed. Which 5 candidates for City Council? Sherrie Cohen, running for an at-large position. Tonya Bah, running in District 8 against incumbent Cindy Bass. Joe Cox, running as an Independent for an at-large position. Justin DeBerardinis, also running for an at-large position. And, late breaking, Adrian Rivera-Reyes, who signed the pledge this morning! Adrian is another at-large candidate. If you have a candidate you support, please ask them to sign this pledge. It’s important that our elected representatives speak for us and not the fossil fuel industry pushing for growth at any cost. Tanya: We also ask that each candidate commit to approving no new fossil fuel projects. Fossil fuel projects are long-term investments. They take a lot of money to build and they take time — as with any business — to become profitable. If we permit a new fossil-fuel processing plant today, the investors will not want to take it offline until it’s been fully paid for and after they’ve made a decent return on their investment. That could be at least two decades. We actually want no new fossil-fuel generation — ever again. Permitting a new project locks us into continuing greenhouse gas emissions that we really need to stop as soon as possible. We have twelve years to reduce our emissions by 50%. Increasing our output of fossil fuels emissions is doing just the opposite of making a reduction. We should decide what sort of future we want. Meenal: Globally, over 400 organizations call on world leaders to end new fossil fuel development, to keep fossil fuels right where they are — deep in the ground. The movement is called Keep It In the Ground. Their open letter to world leaders, The Sky’s Limit: No New Fossil Fuel Development can be found at keepitintheground.org. Most of the candidates, including the 2 incumbents present, answered Yes. Community ownership helps to ensure that an organization’s mission is focused on the product or service and not on the profits. Local ownership ensure that revenues stay local and remain with the organization for ongoing development and growth. This forum was organized by The Alliance for a Just Philadelphia and consists of about 30 local groups. Let’s pause and reflect on this. That 30 local organizations, none of which are “environmental” groups, are asking City Council candidates to halt all new fossil fuel development. And to do so in a way that respects the current workforce, training and relocating them to employment outside of the fossil fuel industry. Again, in an alliance of groups concerned about preventing gun violence, affordable housing, increasing the minimum wage, and more, there was also an agreement about the need to halt all new fossil fuel development. It seemed the at-large candidates present were also in agreement. Grassroots groups 350 Philadelphia and Neighbors Against the Gas Plants are planning their 8th appeal hearing. They’re appealing our City’s decision to give SEPTA permission to pollute by OK’ing permits for the Nicetown gas plant. The citizens are appealing this decision… For the 8th time. Join them in solidarity on Tuesday April 2nd. You’ll find details on our calendar page at phillytalksclimate.wordpress.com. These groups and 27 others are also questioning PGW’s proposal to build a liquid natural gas facility. A project approved by the Philadelphia Gas Commission, by Mayor Kenney’s administration, and by City Council’s Committee on Transportation and Public Utilities. This project still needs a full City Council vote, and the only Council member who seems understands the need to end fossil fuel development is Helen Gym. To learn more, go to 350philly.org/NoLNG. What’s going on? Citizens and candidates seems to agree, but the incumbents still cling to the 20th century myth that fossil fuels will bring us the good life. If you have a candidate you support, it’s imperative that they understand the 21st century need to end fossil fuel development. Tanya: We ask that candidates hold polluters accountable. This includes polluters such as the refinery in Southwest Philly, which is owned and operated by Philadelphia Energy Solutions, or PES. PES owes $3.8M in back-taxes to the Commonwealth, meaning the State of Pennsylvania. This refinery is likely to declare bankruptcy in the next couple of years. We think the riverside site that this refinery sits on could be reclaimed for better use as a park and a site for the development of renewable energy. Meenal: Meanwhile, the families living closest to this refinery deal with poor air quality, leading to cancer, asthma and early deaths. Too poor to move away. With the organization Philly Thrive, these nearby families are standing up for their Right to Breathe, and they are demanding: Pay Up PES! You’ll find more about this campaign on the Philly Thrive website. Tanya: We need to ban the storage and transport of fossil fuels in and through Philadelphia.We currently have trains that bring oil through Philadelphia and into the PES refinery, often times using the freight rail lines along the trails as their parking lot. We don’t think this is a hazard we should allow. Meenal: If there’s no refinery, we should also be free of these trains with highly volatile, meaning flammable, liquids. Some people call them “bomb trains”, because of explosions in other parts of the county. Tanya: The City should divest from fossil fuel and pipeline projects.The pension account investments and other investments made by our city should not be in the fossil fuels and pipelines markets. Investing in any market means supporting their development, and it makes the City complicit in the creation of poor air quality and in climate change. The City already does stipulate companies in which it will not invest its pension funds, so we think this list should be updated to include fossil-fuel companies and pipeline projects. We think that a great alternative to investing in private companies would be the creation of a City-run public bank. This bank could invest its own money and other local money in worthy public projects, with market-rate returns. Meenal: There is a coalition currently advocating for a public bank in Philadelphia. And, there are student groups asking their universities to look at their endowment funds, and divest from fossil fuels. Notable local groups are Fossil Free Penn and Fossil Free Drexel. Tanya: We need a citywide commitment to a one hundred percent renewable energy goal. We know that we need to transition our energy needs to one hundred percent renewable energy — for city government as well as the private sector — for our electric usage as well as how we heat our buildings and how we get around. Before we can take the first step, we need to set a goal. We propose a goal that 100% of our electricity be from renewable sources by 2030. And a goal that 100% of our heating and transportation needs be powered by renewable sources by 2050. It would be ideal if we can achieve these goals sooner than 2030 and 2050. The young people today who will be our age in 2050 will be thanking us for our foresight. When I hear young people talk about the changes in climate they’ve already experienced in their short lives, I’m pretty horrified at the world they will experience if we don’t make these serious changes. Meenal: How do we do this, you ask? The Sierra Club has a national campaign called Ready for 100, where local municipalities are stepping up to reclaim their energy future. Aware of the climate crisis, they’re asking what they can do at the local level. To date, over 112 cities and towns across the US have stepped up. Beginning with a resolution that sets their goal, each town then looks at their energy needs and begins public discussions about the transition to renewable energy. Locally, we’ve had teams in Chester County leading the way. In 2017, Phoenixville, West Chester, Downingtown each passed their resolution. In 2018, Kennett and East Bradford passed a resolution. Most recently, Uwchlan and Schuylkill townships joined the fray. That’s a total of 7 in Chester County. In Delaware County, first Havertown, and then Radnor have a Ready for 100 resolution. The efforts in Montgomery County seem to be flowering this spring, with resolutions from Springfield, then Whitemarsh, Cheltenham, and Ambler in the last month. Conshohocken passed this resolution just last night. Where’s Philly in all this? In June of 2017, Mayor Kenney became 100th US Mayor to sign the Mayors for Clean Energy pledge. This led to much fanfare that summer and fall, including mapping out a roadmap for transitioning our municipal facilities to 100% renewable electricity. Yup, clean energy for all 600 buildings managed by the City of Philadelphia. This has lead to some real action, because this winter, our City sealed a contract to buy about 22% of their electricity needs from a new solar farm. They did this at the same price they currently pay for electricity. Think about it. 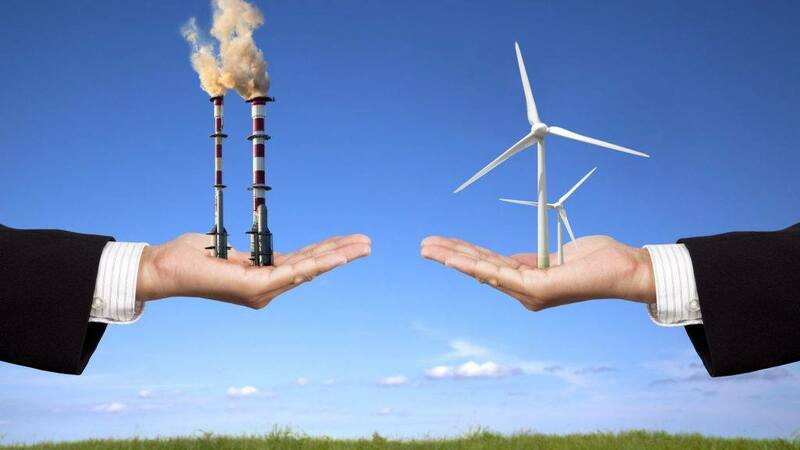 Clean electricity can match the price of dirty electricity. This solar farm will be the largest in Pennsylvania. The buzz from Mayor Kenney’s pledge in June 2017 also led to a City-wide Energy Vision. A vision of reducing our entire City’s greenhouse gas emissions by 80 percent by 2050. For all of our needs. But can we count on future administrations to stick to the plan? We need buy-in from city council to establish a commitment and guidelines for future energy-related decision making. This buy-in could be done by passing a resolution, much like the suburban townships have. This buy-in would mean we wouldn’t be questioning plans for each new fossil fuel project our own City government considers. Philly has yet to pass a resolution commiting us to a 100% renewable energy goal. We’re ready for 100! We need candidates bold enough to set this goal. a future built on caring for each other and our planet. The City should incentivize the adoption of solar power. With solar power on every viable rooftop, we can move toward a mix of renewable energy sources, become energy-independent, and reduce our need for fossil fuels. Solar power requires installation. No power generating plants, no huge expanse of land that becomes contaminated, and no energy to run it, and no dangerous fuels to haul in to the city. The City could make solar power affordable by offering financing, which we could pay through our PECO bills. Meenal: The School District should place solar panels on every rooftop. Even when schools are not in session, these large school building roofs could produce electricity. This can help reduce electricity demand on the grid, when the demand is high for cooling, price go up for all of us, and fossil fuel power plants crank into high gear. Tanya: The City should install geothermal energy systems beneath our streets. Geothermal energy is an excellent way to heat and cool building spaces, as it uses the temperature beneath the ground (which is 54 degrees) as a starting point. The system is a closed-circuit system of pipes that run under the ground. The fluid is at ground temperature. To heat a space, a little bit of electricity is used to heat the fluid to bring the space to a more comfortable temperature. Likewise, it cools spaces by circulating the heat in the pipes back to the ground, removing the heat and making the spaces feel cooler. Geothermal pipes are typically laid under the ground in open fields and under parking lots. But they can also be laid out in basements and under our streets. Meenal: PECO should expand the adoption of its Smart A/C Saver program. This program controls air conditioning systems centrally to manage peak demand for electricity. It helps ensure there is enough electricity, especially during heat events. The ability to do this is critical, especially as we transition to renewable energy. Tanya: PECO should also set up variable billing rates. Variable billing rates incentivize the use of electricity when there is less demand. Examples of what you might use when energy costs less are… charging cars, using dishwashers, washing machines,and dryers. These appliances can all work with timers so that they work at off-peak times like the middle of the night. Homes can also be equipped with all-power-off switches to reduce the phantom power used while appliances are in stand-by mode. This, of course, also saves you money. Meenal: We welcome your questions and comments about anything we’ve shared, so please reach out to us on our website: phillytalksclimate.wordpress.com or on our facebook page: PhillyTalksClimate. Again, this is Meenal and Tanya on Philly Talks Climate. Listen on Fridays at noon at PhillyCAM’s WPPM, people powered media at 106.5 FM in Philadelphia! And afterwards, at phillytalksclimate.wordpress.com. Thanks for listening!